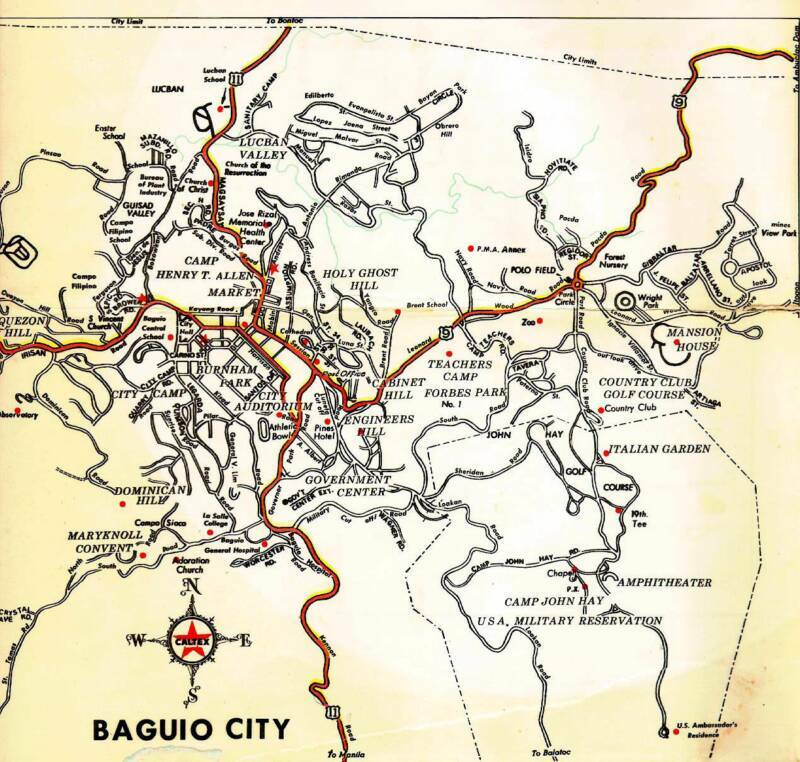 Baguio Maps | Road & Area Maps of Baguio City | Go Baguio! Buying a Baguio City map upon arrival is highly recommended for visitors who are unfamiliar with our winding roads. The best places to get them would be at the gasoline stations, when you refuel your car after climbing Marcos Highway, or Kennon Road. Maps should cost no more than Php100 ($2.00), although you can get decent ones at half that price. 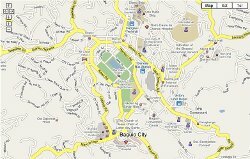 Interactive Map of Baguio City with Street View - NEW! This one is very useful because it contains as shaded rectangle that shows the Central Business District area subject to the Number Coding Scheme. Like the one above it show the names of major roads. It's finally here! 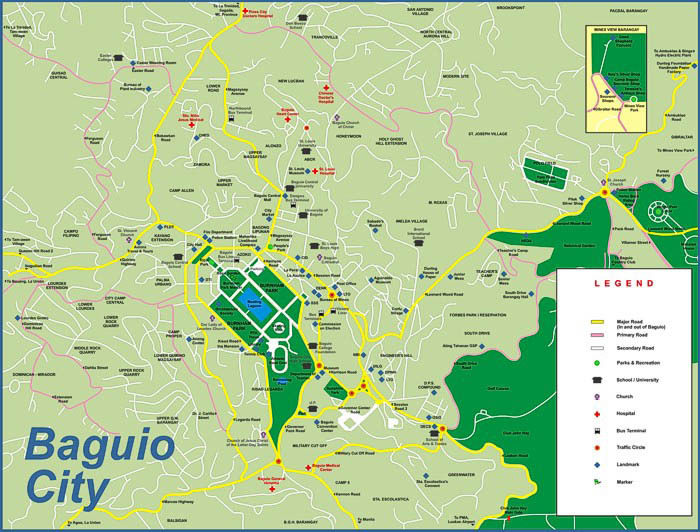 A scrollable, zoomable map of Baguio City that you can explore closely to find places for sightseeing, lodging, dining and more! An older map, this one I like because it shows the major tourist attractions, points of interest and residential areas of the Summer Capital of the Philippines and is not cluttered by too much information so major street names are easy to find. This one shows the location of the City of Pines in relation to the Benguet and La Union provinces in the Philippines. The red lines indicate access roads to the Summer Capital (e.g. Naguilian Road, Marcos Highway & Kennon Road partially. More information about getting here is available at the travel advisory section. 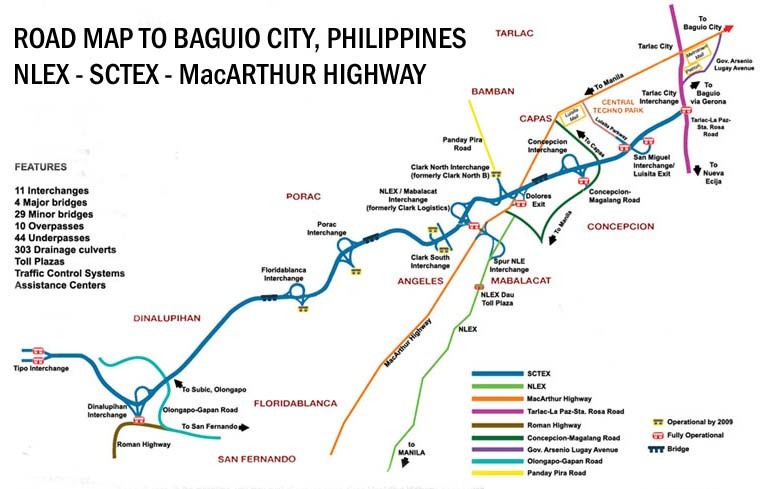 A modified SCTEX map shows the the relation of the North Luzon Expressway, the Subic-Clark-Tarlac Expressway and MacArthur Highway to each other. This one is particularly helpful so that one can determine which SCTEX exits to take to get to the City of Pines faster. Here's one that contains ia lot of information, including icons that indicate buildings, mostly government, medical & educational institutions. Some street names are not very easy to find, in my opinion because, they are just indicated by arrows pointing to the roads. Or print any one of the maps we have included below that we have found all over the web. The first map enlarges when you click on it, and hopefully will be big enough to be useful to you. These maps come very handy while checking the area for your sightseeing, shopping, lodging and dining needs, or if you are looking to buy or rent real estate in Baguio City, Philippines.